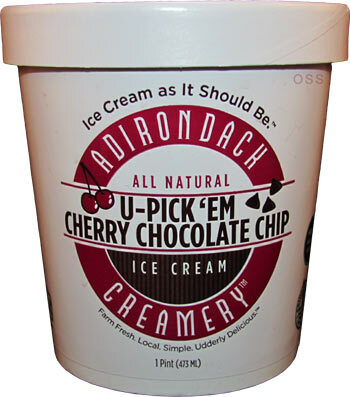 [By Nick] It's been awhile since I've reviewed an Adirondack Creamery flavor. Let's change that with a recent pick up from the Niskayuna Co-op. This is a relatively new flavor for Adirondack coming out last year if I remember correctly. I've yet to find a chocolate cherry flavor I actually loved. Nothing has wowed me yet and I'm running out of cherry flavors to try. Hopefully Adirondack is up to the task. Okay, I was a little taken aback when I opened this pint. 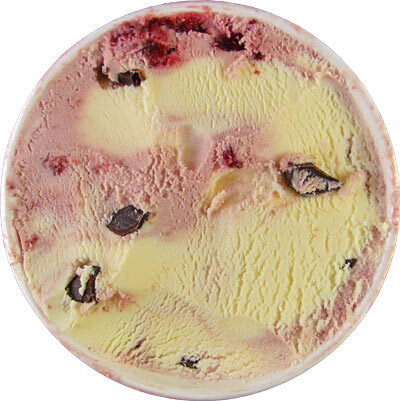 I thought it was going to be the standard cherry ice cream with chocolate chips ordeal. That's not the case with the addition of what I'm calling vanilla ice cream to the mix. Their website doesn't mention a thing about the bases but there's pure vanilla extract in the ingredients so it's now vanilla ice cream. 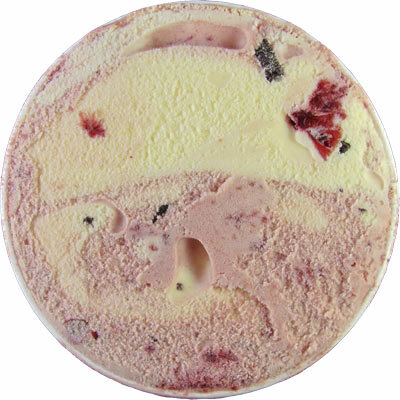 Scooping down reveals even more cherries and chocolate chunks as well. The cherry base is nice and fresh. Not artificial or medicine-like which other brands are known for. It tastes like fresh cherries and goes well with the vanilla base. There's not much to say about it other than it tastes like vanilla and there is almost a cherries and cream vibe going on when combined. The black cherries are exactly as I'd hope they'd be. Fresh, juicy and slightly tart. Thankfully there's no sad icy cherries here. 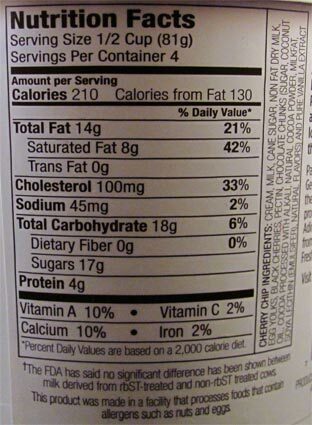 The chocolate chunks aren't all that remarkable to be honest. They taste like your standard bittersweet chocolate. They're not bad but they don't stand out like a high quality chocolate would against the fruity base. This is a good flavor, don't get me wrong. It's just falls into the middle of the road with all the other cherry flavors I've had. Will I ever be satisfied with a prepackaged cherry ice cream? The world may never know. Sounds like you need to go to a high end Chinese restaurant and order you some Cherries Jubilee. We've got a place out here that does them fresh right at the table with the fire and the burning and the whoo! Tasty. TTB, that's not ice cream though. Sheboygan, WI, near the Door penisula where sour (tart, pie) cherries are grown, has an ice cream shop with sour/tart/pie/ice cream cherry ice cream which is wonderful. All the plastic pink and sweet cherries do not cut it.